The Global Hawk unmanned high-altitude reconnaissance aircraft of the U.S. military, at Edwards Air Force Base in California. 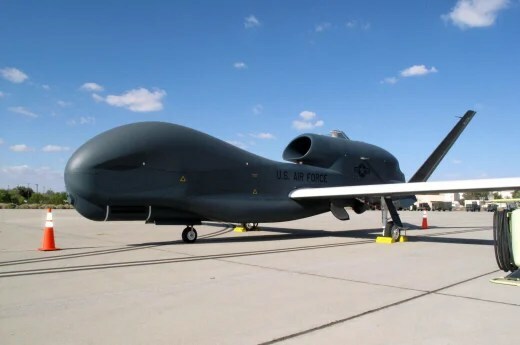 The “Global Hawk” — the U.S. military’s high-altitude, long-endurance aerial drone — flew its first surveillance mission over Nigeria on Tuesday in search of some 276 school girls kidnapped by the Boko Haram terrorist group, U.S. officials told NBC News. With a wingspan of just over 130 feet, the Global Hawk’s air time is a huge advantage in surveillance operations: It can remain airborne for 28 hours with a range of 8,700 miles and has a top speed of 310 knots (357 mph), according to the Air Force. 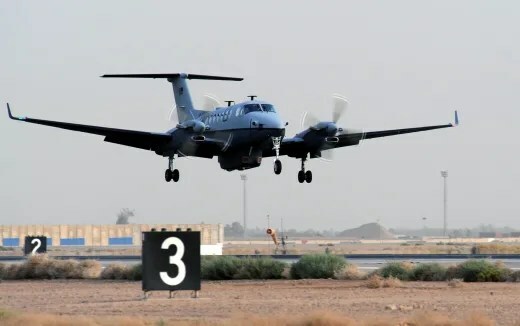 The MC-12 Liberty aircraft is an intelligence, surveillance and reconnaissance platform. On Monday the Boko Haram militants released a video that showed about 100 of the girls — who had been ostensibly “converted” to Islam — and said they were open to an exchange of the kidnapped students for the release of other Islamic terrorists imprisoned in Nigeria. The Nigerian government has said “all options” are open, including negotiations or a possible military operation with foreign assistance. “With respect to Nigeria, our people are on the ground. We are proud to be contributing to the effort in order to help find these young women,” Kerry said in Washington.